In the West, water wars never really end — they just fade away, only to re-emerge during a drought, or when there’s a new proposal to build another dam or divert a river through a mountain range. The latest flare-up, not surprisingly, is about the 1,450-mile-long Colorado River, born in crystal clear springs in the Rocky Mountains of Colorado and Wyoming. In wet years it reaches the Gulf of California as a muddy trickle. In dry years, it vanishes in the dust before empties into the sea, and long before it satisfies all the claims that have been made on it. Along the way, the river hydrates 40 million people and hundreds of millions of dollars worth of produce, from Denver through Arizona and Nevada, all the way to Southern California, via dams, pipelines, and diversions. In early July, Denver Water, Colorado’s largest water provider, won a crucial permit from the federal government to once again tinker with the plumbing and make the river work just a little bit harder. The $360 million Moffat Tunnel Collection System expansion project would divert more water (about 4 billion gallons per year) from the Fraser River, one of the Colorado’s primary tributaries, west of the Rockies’ crest. The water would be shunted eastward through the existing six-mile Moffat Tunnel beneath the Rockies, emerging near Boulder and emptying into Gross Reservoir, where an existing dam would be heightened by 131 feet. Denver Water CEO Jim Lochhead says the project will protect Denver against shortfalls during drought. “We will complete this project responsibly, as evidenced by our actions during the public process and the resulting robust environmental protections we’ve agreed to along the way. We’re proud to be doing the right thing,” he says. Crumbling gravestones under tilted cottonwoods in Nevada, Utah and Colorado stand testament to the deadly feuds that erupted over the rights to rivers and streams during the Gold Rush. In time, western communities adopted a first-come, first-serve rule for water. That so-called right of prior appropriation shaped the modern West, including Denver, which is to Colorado what Los Angeles is to California — a thirsty sponge soaking up water from valleys and mountain ranges far from city taps. River conservation advocates say Denver’s plan is an expensive boondoggle and will further dry up the Colorado and some of its key mountain tributaries that have already been severely depleted. Before the ink was dry on the U.S. Army Corps of Engineer permit, the watchdog group Save the Colorado said it would likely challenge the decision in court. The brewing legal battle over the project is emblematic of emerging water conflicts worldwide in a warming world, but there are some seeds of hope. Some western water experts say that far-reaching conservation measures included in the permit will actually help improve conditions in some streams with extensive monitoring and adaptive management. Denver Water will monitor streams below the diversion points and curtail the amount of water it takes when conditions approach dangerous thresholds for fish. The water provider will also maintain a certain amount of water in the enlarged reservoir for environmental flows, available to bolster streams during dry spells. The details are spelled out in a series of agreements with towns, water agencies and environmental groups, marking a departure from the old days, when a water rights owner would simply go to court to validate a claim. Denver Water has also committed millions of dollars to restoring native fish and to cleaning up streams polluted by decades of traction sand washing off mountain highways, and to rebuilding some stream channels so they provide habitat at lower flows. All those are measures that will be needed along many rivers in the future to adapt to global warming, even absent any new dams. Residents of the Colorado mountain towns that would be most affected by the new diversions are well aware that global warming will cause intensifying heatwaves and droughts that will dry up aquifers and reservoirs and prematurely melt mountain snows feeding river systems during the summer months. Andy Miller, who has watched the water wars since the 1970s — first as a journalist and more recently as a town trustee in Fraser, just few miles downstream of Denver Water’s diversions — says Denver doesn’t have the right to completely degrade the headwaters of the Colorado River in Grand County. Miller says existing diversions have already limited the town’s opportunities for economic growth and raised the price of water as local demand increases. The legal framework for allocating Colorado River water is a house of cards that will collapse when global warming causes the inevitable multi-year drought across the river’s basin. That alone is reason enough to try and halt the project, says Gary Wockner, of Save the Colorado. “Climate change has increasingly drained the Colorado River. It’s already severely depleted, and the people of Boulder County don’t want the project,” he says, referring to neighborhood groups around the existing reservoir, where the enlargement would require several years of intensive construction. Wockner says some simple math shows Denver Water would be far better off investing in conservation. The cost of the new project is estimated at about $380 million and would yield about 18,000 acre feet of water. During the recent California drought, the Metropolitan Water District of Southern California spent about $350 million to pay people to get rid of their lawns, yielding about 80,000 acre feet, according to Wockner. “It’s an extraordinary waste of money to be building dams. The vast majority of this is about grass and lawns. This is immoral in my opinion,” he says. And since the project was proposed, new research has bolstered the evidence that the Colorado River is vulnerable to global warming impacts. One new study shows that warming alone, regardless of precipitation trends, will cut the river’s flows 30 percent by 2050, an amount that would make any additional diversion unsustainable. Wockner said the Corps also didn’t adequately account for Denver’s declining water usage, which has dropped from more than 100 gallons per person daily to 82 gallons daily since 2001. A court battle might be satisfying in some ways, but the outcome is uncertain and the need to make the best of limited resources is only going to grow, says Ken Neubecker, who has been advocating river conservation for decades. Neubecker heads the Colorado Basin program for American Rivers, which has put the Colorado on its endangered river list several times, so it’s surprising to hear him say that this might be the best deal the river can get. Douglas S. Kenney, director of the Western Water Policy Program, has also been watching the water wars the past few decades, and says that any project that pulls more water from the Colorado River is a real concern. Other proposals have included a new dam on the relatively free-flowing Yampa River in western Colorado, and the so-called Big Straw that would siphon water out of the Colorado River at the Utah border and pump it hundreds of miles back upstream. 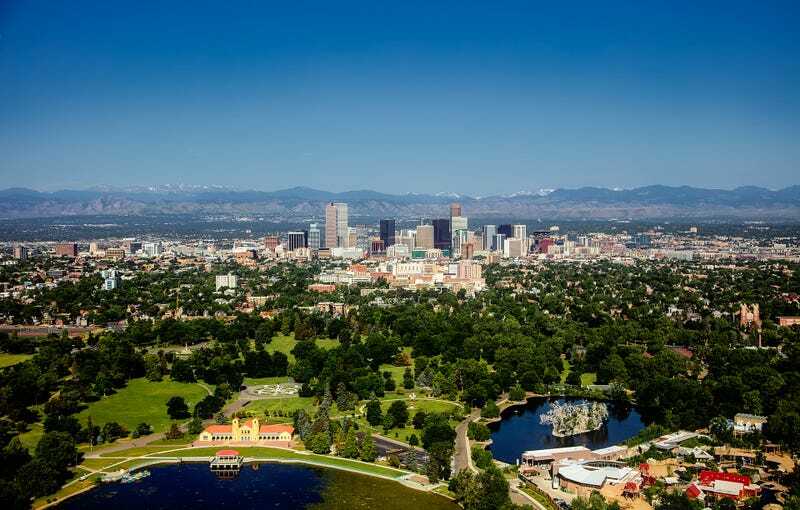 The real long-term solution to supply water for the thirsty and sprawling metropolitan complex around Denver is more regional water sharing and planning, says Mark Squillace, a UC Boulder natural resources law professor. But current water governance discourages cooperation, so each town hoards its own supply and tries to ensure redundancy. En Route To G20, Trump Is Stopping In Poland For A Coal Lovefest. He&apos;ll Need It.